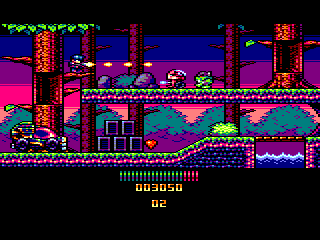 A friend on MSN suggested I put together some of the Amstrad Mode 0 16 color stuff I've done over the last few years just for easy reference so here they be. If anyone wonders why I've done this many pieces based on the resolution and palette of a 1984 home computer it could be just a nostalgic thing trying to recapture what I found appealing about my childhood gaming in the 80's playing on my CPC 464 (which also got me into spriting in the first place) but it's also that I've always found a 'limited' palette and low resolutions more interesting to create pixel art with. In a higher resolution with millions of colors I find it too easy to make things look 'realistic' whereas I feel these supposed 'limitations' encourage experimentation with sprite design and color usage. I sorta miss the time where the same game on various different formats would have it's own unique look and feel. 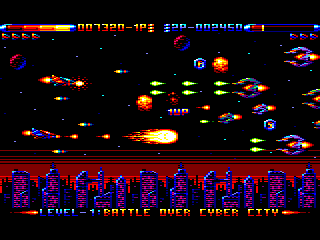 Originally started by doing a Mode 0 mockup of how R-Type might have looked if the CPC version hadn't just been a lazy cheap looking (but still very playable) Spectrum port. 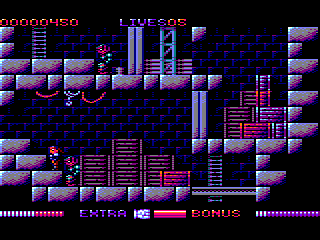 The level floor ended up having to be gray/light blue as the original's sorta beige colors don't really have a decent equivalent in the CPC palette. Next up was the Mode 0 version of my favorite 8 bit game Switchblade. It looked fine in the low color Mode 1 anyways but I wanted to see how it might have looked in the blockier but more colorful Mode 0. Even with the extra color I tried to keep it fairly dark and atmospheric. 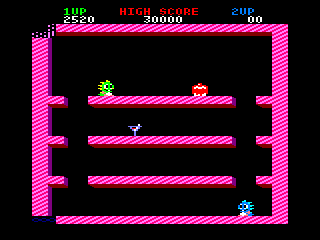 Last revamp mock up I did was for Bubble Bobble. This was more of a quick edit that complete redraw though the Bub and Bob sprites were redrawn, the level tiles were corrected with the stripes going the correct way and colors in general were made more accurate to the arcade original. 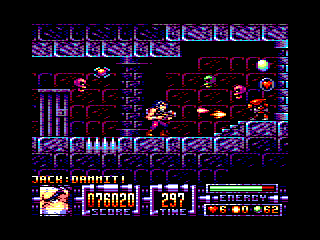 The graphics on the original CPC port really made no sense to me at all. The loading screen was fine though. 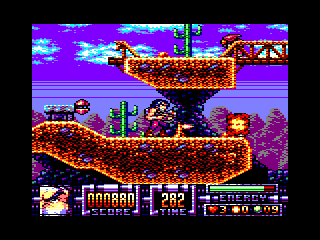 After that I took part in a Pixelation fad to create an avatar along the same general design specs as everyone but I chose to do it in a funky CPC style. It's supposed to animate but for some reason refuses to do so posted in this blog. If anyone knows why please let me know. A while later I decided to create an original mock up. 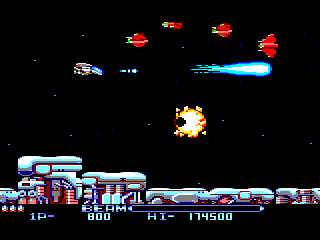 Felt the wide pixels and the bright bold colors suited a horizontal shooter and created one deliberately trying to avoid any similarity to the R-Type mock I'd done before. 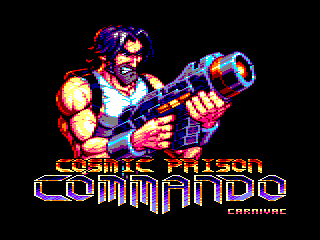 For the Retro Remakes 2008 contest I went with the 'We Like It Retro' category and created a CPC-style playable game called Cosmic Prison Commando. It's still unfinished and the demo out is a bit buggy but playable and in my opinion pretty fun. And for Mode 0 completion sake here's the Blasterine shot again. Will replace with a new one during this week most likely. I would add Hotel of Hell here but it's a Mode 1 resolution and doesn't really fit in this category despite being intended for the Amstrad CPC. For a quick direct link to the post about it though click on this.